"I learned how to play the game of literature--a game of power and precision and elegance--from reading Fritz Leiber, but it was a lesson I learned in fits, chasing his stories across scattershot anthologies. What a blessing and a pleasure that we can all now be schooled, easily and everlastingly, by this marvelous collection." "He was one of the giants of genre literature and it is hard to imagine the world of tales we read today being the same without him.... Fritz Leiber's better short stories do the thing a fine whisky does... they leave aftertastes in memory, an emotional residue and resonance that remains long after the final page has been turned." "For anyone who loves great literature, Fritz Leiber walked on water." Known in his lifetime primarily to readers of science fiction and fantasy, Fritz Leiber is now recognized as one of the finest writers of popular fiction of the twentieth century. An intimate of H. P. Lovecraft, Leiber crafted the twentieth century's first great stories of urban horror, created the sword and sorcery tale almost single-handedly, and wrote strong, resonant science fiction. Nothing less than a visionary American author, Leiber is considered by critics and fans alike to be one of our most original and versatile storytellers. anthologist Jonathan Strahan and Locus magazine founder Charles N. Brown, Fritz Leiber: Selected Stories presents a wide sampling of his best short fiction so that a new generation of twenty-first century readers can continue to discover and enjoy his groundbreaking and memorable fiction. Fritz Reuter Leiber, Jr. (1910-1992) was an American author of fantasy, horror, and science fiction. The son of a pair of Shakespearian actors, Leiber was also an actor, expert chess player, and champion fencer. Born in Chicago in 1910, Leiber spent his youth touring with his parents' theater company. He graduated with honors in philosophy from the University of Chicago in 1932. Leiber married Jonquil Stephens in 1936. In 1938, their son Justin was born. After Jonquil's death in 1969, Fritz Leiber moved to San Francisco, where he died on September 5, 1992. Leiber's formative sword-and-sorcery story, "Two Sought Adventure," was published in Unknown magazine in 1939. Subsequent stories and novels would appear in such magazines as Astounding, Dangerous Visions, Fantastic, Magazine of Fantasy & Science Fiction, Galaxy, Other Worlds, Star Science Fiction Stories, and Weird Tales. A number of Leiber's works have been adapted for film or television. 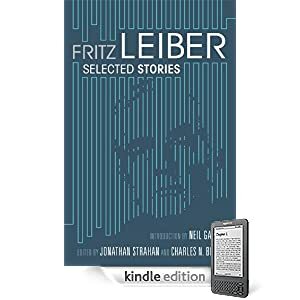 Or purchase Fritz Leiber: Selected Stories as a DRM-free e-book in the format of your choice through WebScription.net.